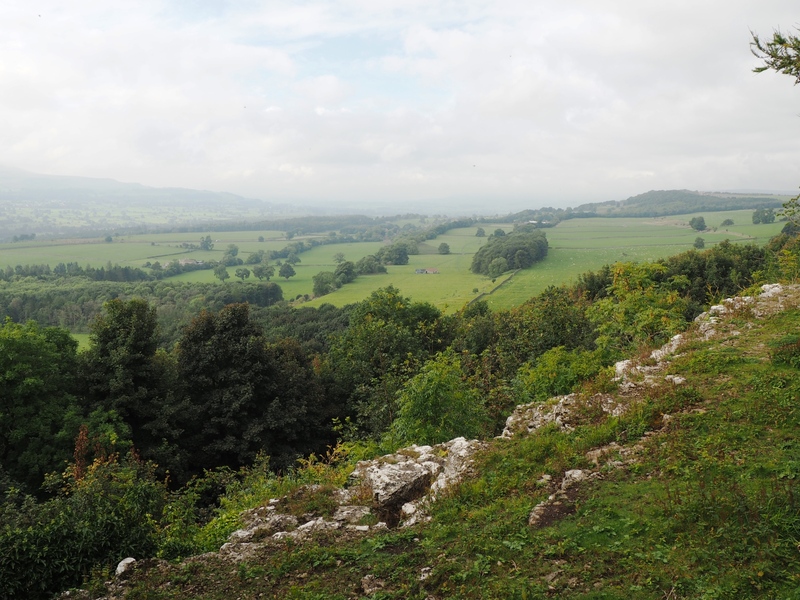 A gentle walk along the limestone escarpment of Leyburn Shawl before returning via Wensley Park, Wensley Falls and Leyburn Old Glebe Nature Reserve. Leyburn Shawl, or simply ‘The Shawl’, is the name of a limestone scar of modest height that stretches almost two miles west of Leyburn. The aim of this walk was to walk the length of The Shawl and then visit the village of Wensley on the way back. Setting off from the car park in Leyburn we crossed the main square and then smaller square to to follow signs for ‘The Shawl’ along the aptly named Shawl Terrace. Within a few minutes of leaving the town centre we arrived on the eastern end of The Shawl. Almost immediately the views opened out over Wensleydale, or at least they would have done if the morning mist and fog had cleared up a bit quicker. This first open section of The Shawl proved to be short lived and soon the path was following the outside of the woods which blocked the view over the escarpment. Indeed good viewpoints along The Shawl were at something of a premium. That the treeline had encroached on older viewpoints could be seen by the odd bench situated looking at nothing more than the leafy canopy. About halfway along there was a short open section which was easily the highlight of the first half of the walk. The limestone scar was substantial and the view across Wensleydale stretched as far as Addlebrough. Although the view was restricted for the remainder of the length of The Shawl it was still pleasant walking on a nice woodland path. Eventually a signpost signalled the end of the escarpment and we emerged out of the woods for a nice descent across gentle grassy pastures towards the farm at Tullis Cote. Gaining a track at the farm we passed the remains of the Keld Heads Smelt Mill, with its impressively preserved chimney, to reach the minor road to Preston-under-Scar. Crossing over the road we crossed another field and then the Wensleydale Railway to reach the Wensley to Redmire road. Turning briefly left on this we soon left the road again to enjoy a nice walk across Wensley Park. The highlight of this part of the walk was the giant oak in the centre of the park. Entering Wensley we first went in search of Wensley Falls. Unmarked on the map this proved to be a lovely little waterfall which was easily accessible via a permissive path to the side of the White Rose Candle Workshop. The latter was also well worth visiting and after purchasing a candle for Lisa we then enjoyed a lovely pub lunch in the neighbouring Three Horseshoes. After stuffing ourselves with lunch all that was left was a gentle walk back across fields to Leyburn, finishing along Low Wood Lane. Along the way we also passed across the Leyburn Old Glebe Nature Reserve. Best known for its wildflowers we were too late in the season to see anything – between May and June is apparently the best time to visit. All in all this was a pleasant little walk and it was nice to cover one of the few sections of Wensleydale that I’d not previously explored. Coupled with a nice lunch and a visit to the candle shop this proved to be a nice day out. Nicely put together walk…..Good chance we might be using it at the end of March. Spending 4 days at Redmire…. Three of us completed your well described walk today. We were looking for an easy walk with interesting terrain and views and this fitted the bill admirably. The weather turned out better than forecast. We began and ended the walk at Mrs Pumphreys tea rooms in Leyburn and lunched at The Three Horseshoes and can recommend both establishments. We drove home content with a quantity of Wensleydale cheese from Campbells of Leyburn. Thank you for the inspiration. If we ever walk the route again we would probably opt to finish through the fields rather than the stony Low Wood Lane. Regards Mike.